FRAMED PRINT. 22x18 inch (56x46cm) Framed Print with Black Satin with Off-White Digital Mat. Artwork depicting GYPSY a CRYSTAL BALL. 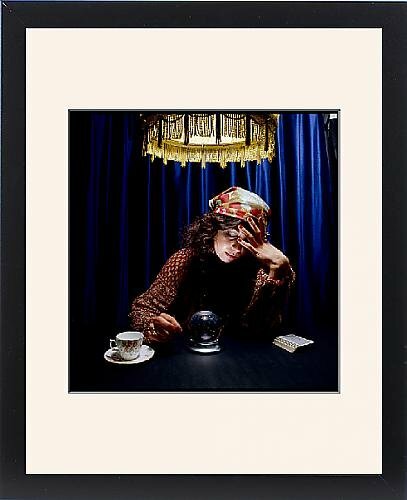 A Gypsy fortune teller gazes deeply into a crystal ball. Other tools of divination are nearby, the drained teacup for reading the tea leaves, and a pack of cards for the tarot. Professionally made to order in the USA. Artwork Description... A Gypsy fortune teller gazes deeply into a crystal ball. Other tools of divination are nearby, the drained teacup for reading the tea leaves, and a pack of cards for the tarot.